Huge Savings Item! 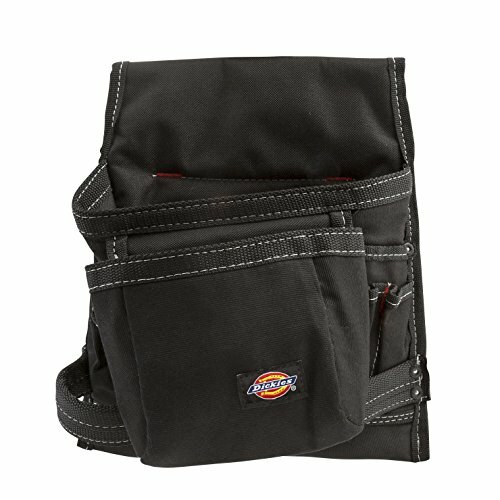 Save 12% on the Dickies Work Gear 57075 8-Pocket Tool and Utility Pouch by Dickies Work Gear at N Online Agency. MPN: 57075. Hurry! Limited time offer. Offer valid only while supplies last. The Dickies Work Gear 57075 8-Pocket Tool and Utility Pouch allows for easy separation of tools and accessories to maximize storage organization. The Dickies Work Gear 57075 8-Pocket Tool and Utility Pouch allows for easy separation of tools and accessories to maximize storage organization. This professional pouch is constructed of heavy-duty black canvas and features an upright design with one large main pocket for easy access to your tools. There’s a smaller pocket at the front for nails, screws or drill bits and two rivet-reinforced hammer loops allowing for easy left or right-handed use. There are also four pockets for small hand tools and two plier pockets for additional storage. It comfortably fits on a two-inch belt, and is a must-have for any professional or DIYer looking for a quality pouch.